On Friday my youngest nephew turned 11! Happy birthday Max! His birthday party is going to be held this weekend at an archery venue. I had planned to keep with the theme and make him a card based around archery but I couldn’t find a stamp set that I loved enough to use for more than just this card. (I do try to make purchases where I can use the set over and over). I finally found one I liked a lot – Mama Elephant’s On Target. I also thought the Avery Elle’s Aim High had potential too – thanks Elle!) but by the time I decided to go ahead I was concerned that I wouldn’t get them delivered in time. I couldn’t find a local stockist for either stamp set. Drat! Onto plan B! Max is mad keen on soccer and it just so happens that I had only recently purchased Penny Black’s Sunny Days because it has so many gorgeous images (with a more masculine flavour) including a little soccer playing pooch. Voila! Problem solved. I used the soccer ball to stamp up my own background – really love how it turned out too. Then just made up a little scene for the dog. I kept it very simple. Materials used: Stamps – Sunny Days (Penny Black); A Little Sentimental (Clearly Besotted); Dies – Blueprints 5 (My Favourite Things), Lawn Cuts – Spring Showers, Grassy Border (Lawn Fawn); Designer Paper – 6×6 Paper Pad – Hello Sunshine (Lawn Fawn); Cardstock – American Crafts; Distress Ink; Distress Markers; Glossy Accents and Wink of Stella – Clear. 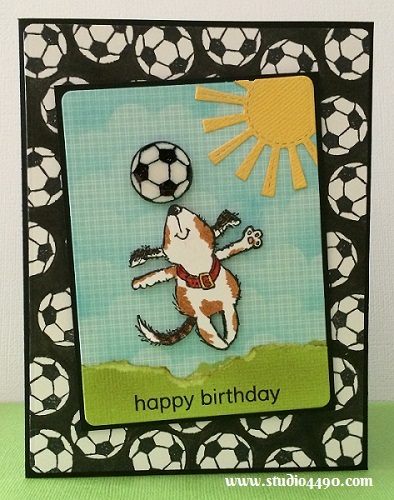 Whilst it doesn’t look overly birthday-esque, I know Max will love it because of the soccer theme. That’s the main thing. Kylie: how perfect is this card for Max! I knew he’d love it from first glimpse; how could he not, when it features this fabulous pooch doing, as Bev called it, a ‘noser’ with the soccer ball! Totally a ‘guy’ card, and totally geared for your nephew’s love for the sport! Tooooo fabulous! And again, you’ve revealed your Queen of the Scene expertise. That background paper: special touch to the max! Love this oodles!! Confession time: I have no LF, ME or AE in my collection! How pathetic is that!! I’m saving my pennies for some AE – I think a ‘local-ish’ distributor may have access to bringing them in, so I have them on my radar. One of these days… Excited to see what magic you’ll work with the ME coming your way!! Ok, so I looked at the card before I closely read your post and I thought for sure that you were using a pre-colored sticker or diecut. And then it turns out you colored it yourself?!?!? How amazing is that!!! You are going to knock the distress markers out of the park. They are so fun to use – and water colour with and I know how majorly talented you are with water colouring. And thanks so much for saying I’ve inspired *you*. That’s so kind. Love this card! Congrats on the Penny Black Facebook mention!! Love this happy card card! Congrats on the Penny Black Facebook mention! Thought you’d like to see another cardmaker with mad coloring skills…I’m sending her link, hope it comes through properly. AWESOME!!!! Oh goodness, your nephew is going to love this. Love all the little soccer balls, and Mr. Cutie Pie doing a ‘noser’! What a wonderful card. Have to tell you, I own a couple of ME and AE sets. They stamp beautifully. Even if you don’t buy them for the arrows, you might consider some sets that you’d use more often. Oh!, and LF’s set with the hot air balloons has an arrow in it too. Have to run, got to get a workout in before John gets out of bed! Have fun at the birthday party, and I just know Max will love that card! hugs. Thanks so much, Bev! He said it was “cute” but not in a scrunched up nosed, don’t like it kind of way so I’ll take that. haha I have some ME and AE stamp sets too. I love them. In fact, don’t tell I have a few additional sets from Mama Elephant due here any day now. Can’t wait. I have the cutest idea! (If I say so myself! lol) I forgot about the Lawn Fawn set and I have that one too. Oh well. lol Thanks again for the great ideas!